WASHINGTONVILLE — Washingtonville embraced being on the free-throw line with the game hanging in the balance. Twelve hours earlier, they were on the same side of the court, in the same gymnasium working on their free throws. Senior guard Victoria Pecovic led both teams with 23 points, and hit two free throws that sealed the victory. She talked about the early morning free throw practice, and how it helped the team. “The last thing most people want to do is wake up at 6:00 in the morning and practice shooting free throws,” she said. The game came down to making free throws, and Washingtonville made 5-out-of-6 of them in the last 30 seconds, pulling away from Saugerties 62-57 Monday evening. The Wizards trailed by as much as 11 points in the second quarter. By the end of the first half, they had 18 turnovers and shot 28% from the field. Senior guard Dyana Budakowski was one of the Wizards with a poor offensive performance in the first half. She went 0-for-3 from the field, all on 3-point attempts. During halftime, she thought to herself what she needed to do better to help her team. “I sat down in the locker room and pondered the things I could do better,” she said. “I knew in the first half I wasn’t shooting the ball good at all, I knew my team needed me to score some points, and that’s what happened. In the first 2:58 of the third quarter, Budakowski scored 12 straight points, leading the Wizards on a 12-1 run to start the second half. The Wizards outscored the Sawyers 19-9 in the quarter, and held onto a 41-37 lead entering the fourth quarter. Neither team led by more than five points in the final quarter. Both exchanged foul shots and jumpshots until Pecovic’s free throws in the final seconds gave the Wizards a five point lead. Grace Van Roy finished with 11 points on 3-of-12 shooting, and Anna Van Roy finished with 10 points on 2-of-7 shooting. They both made five free-throws apiece. Jaclyn Murphy led the Sawyers (4-3) with 14 points, 11 of which came in the first quarter. It’s not about where you start, but where you finish. 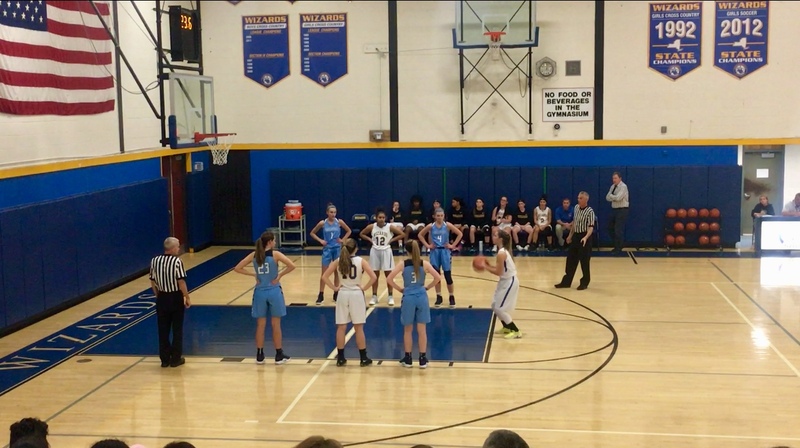 It might not have been the prettiest start for the lady Wizards, but they hope to bounce back and reach the Section 9 final for the second consecutive season.